MEXICO, NY- Cornell Cooperative Extension of Oswego County is accepting registrations into its Shooting Sports Program. The 4-H Shooting Sports Program provides a positive experience for youth and promotes firearm safety. Participants in last year’s program take aim. The program is also valuable for helping youth develop self-confidence, personal discipline, responsibility, teamwork, self-esteem and sportsmanship. The Oswego County Shooting Sports Program is not a hunter safety education program. This program is open to all girls and boys ages 12 to 19 who are interested in rifle. The programs will be conducted as a five-week course concluding with a countywide event in June. The Shooting Sports Rifle program will be held on Thursdays from 6-8 p.m. beginning May 16 at North Sportsman’s Club in West Monroe. Previous experience or firearm ownership is not necessary for youth to participate in this hands-on learning experience. 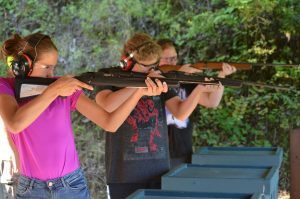 The Oswego County 4-H Program and its instructors, certified through the New York State 4-H Shooting Sports Program, will provide all firearms and necessary equipment. A program fee of $30 will be charged to cover the cost of materials and eye and ear protection. Partial scholarships are available through a donation from the Oswego County Federation of Sportsmen’s Clubs. Space is limited therefore registration is necessary, and parental or guardian permission is mandatory.